What letter to send to ask a copyrighted material owner the official permission to use his copyrighted material? Download this Permission Request to Use Copyrighted Material now if you like to receive official confirmation to make use of copyrighted work. This template covers the most important subjects and will help you to structure and communicate in a professional way with a party that is using your copyrighted work unrightful. 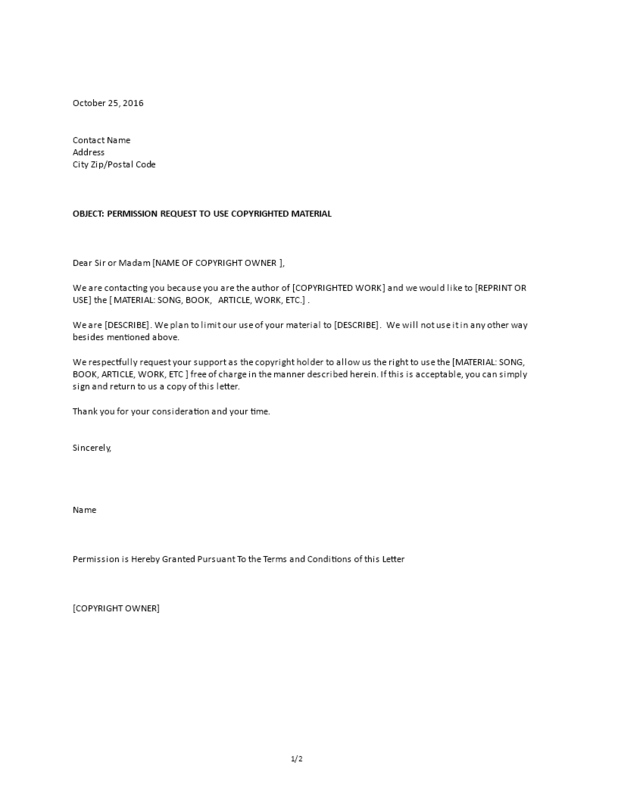 This formal notice template is crafted and screened by Intellectual Property legal professionals. You can send this formal Permission Request to Use Copyrighted Material to inform the copyright holder about the desired usage. Try out our online Free and Premium Intellectual property Legal templates, forms and contracts today. We provide several useful IP Law templates to exercise their rights in a formal way. Working with our templates guarantees you will safe time, costs and efforts!